1. the little descending turn around allows you to play the basic ascending idea starting on both up and down strokes. 3. 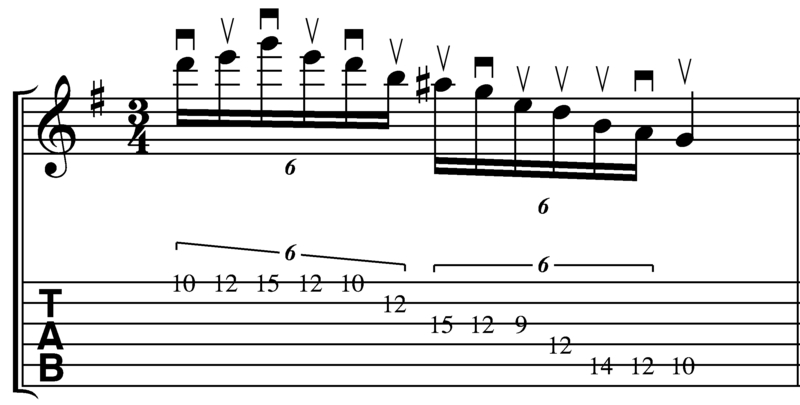 The motion is more diagonally oriented than the strict pentatonic example but is the same basic approach. I start the lick with my first finger and then shift positions for the D on the 12th fret of the D string and the D on the HighE. As variation – I took the same concept and applied it in a more positional approach. Be careful with this stretch! If it hurts stop immediately!!! So I bit the bullet and got an apogee duet. WOW! 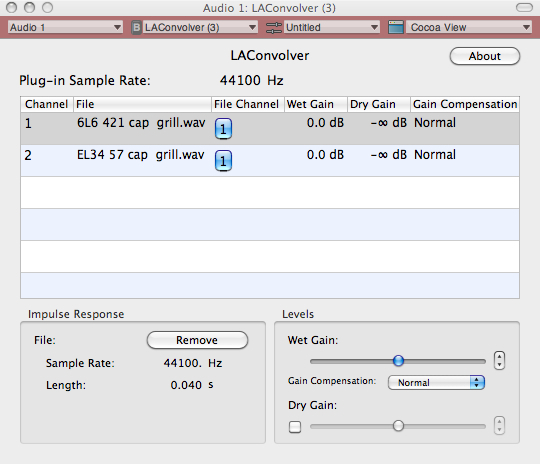 It really has made a stunning difference in resolution and I suspect will help a lot with future mixes I’m working on. With that in mind I wanted to share with the rig I used for the mp3s above. 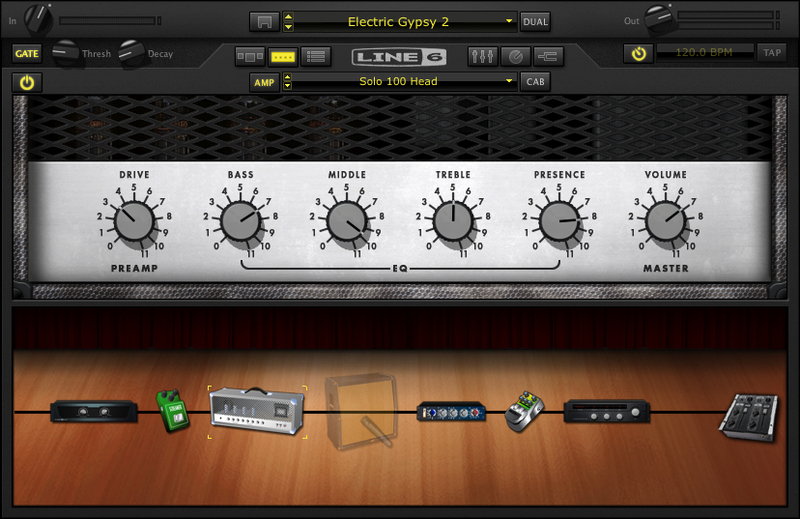 Here was the basic amp setting I used in Pod Farm 2.0. This was based on a customtone forum patch called Electric Gypsy. I just swapped in a tube screamer and bypassed the cab (using the Recabinet impulse responses instead). One of the big revelations that I found in pod farm is that I could put preamps AFTER the power amp. Adding that in to the signal chain opened it up a lot. I blogged about using impulse responses over the cabs before. The lie 6 cabs sound good – but to my ears the IR’s add a whole other area of depth. Here are the IR’s I used – these were from the Modern 1960 4×12 set. The screen shot is from LA convolver. Finally – a screenshot of how it all lays out in AULab. I just hit the record button in au lab and edited out the noise before and after the take in fission. I’m still tweaking things – but I think that soundwise everything is improving a lot from where it was even a month ago. Once I get an A/B set with the floorboard – I think that the laptop is going to be the rig du jour. One last note – the macbook has is using 4 gigs of ram and was updated with a 7200 rpm Seagte internal drive. (500 gig from OWC). My computer accepts a 4gig chip in 1 slot – so I may go up to 6 gigs – but the faster internal drive made a big performance difference in the machine. I’d say you’d really need to have that if you’re going to try to go this route. * Note – I’ve recently posted more on this topic here which may be of interest to you. This entry was posted in Gear, Guitar, Lessons, News, Updates and tagged Apogee Duet, AU Lab, FnH Guitar, Guitar, Guitar lessons, Guitarchitecture, Ho Chi Minh City, laptop guitar, line 6, Pod Farm 2.0, Scott Collins, SooperLooper, vietnam by GuitArchitecture. Bookmark the permalink. Dude you’re awesome! I love the violin bow down/up on your sheet music! Are you in HCMC now? Thanks! I was trying to find something to indicate upstroke-downstroke in Finale – and this was as close as I could come. No I’m back in South Pasadena now – but plan on getting back to HCMC eventually. I really like it there!